September 21, 2016 – MonoSol, the global technology and innovation leader in water-soluble films, celebrates the 90th anniversary of its parent company Kuraray. 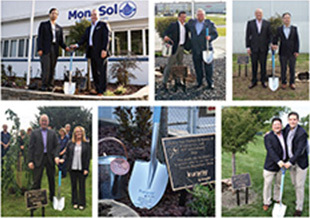 To commemorate this significant milestone and the Kuraray Group’s commitment to improve the environment, MonoSol planted cherry blossom trees at all its locations yesterday, including its headquarters in Merrillville, Indiana, U.S. and several production facilities in Northwest Indiana and Hartlebury, U.K.
Kuraray was founded in Japan in 1926 for the purpose of commercializing synthetic rayon, which was cutting edge technology at the time. Since then, the company has grown its business from fibers and textiles to include plastics, artificial leather, food packaging films, polarizers for LCDs and more. With its acquisition of MonoSol in 2012, Kuraray expanded its product offering of PVA films into a wider range of industrial applications such as unit-dose packaging. To honor the anniversary, every Kuraray division is planting Japan’s national tree, the cherry blossom, at their facilities. Commemorative plaques placed under each tree state Kuraray’s mission: “For the people and the planet – to achieve what no one else can.” Additionally, inspired by Kuraray’s ongoing Sending School Backpacks Across the Sea campaign, MonoSol employees organized their own Operation Backpack drive, filling over 200 backpacks to donate to local children in need.